Mindfulness seems to be everywhere at the moment, breakfast TV, newspapers and lifestyle magazines – even the TV series Cold Feet! What began as an esoteric meditative practice in eastern spiritual traditions is now recognised as an effective approach for significantly increasing health and wellbeing, leading to reduced levels of stress, anxiety and depression. 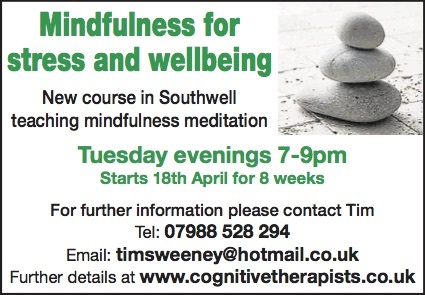 Becoming more mindful helps us to let go of automatic tendencies to 'overthink', worry and brood on problems as we instead learn to fully engage with our present experience, to be 'in the moment'. The rapid rise in the popularity of mindfulness has been helped by research investigating its impact on a diverse range of physical and psychological health problems. Mindfulness has been recommended in national health guidelines since 2004, and a recent government report emphasises the advantages of making this more accessible to the general public.